Light, bright, clean and modern! Anchored by a magnificent oak in the backyard, this lovely Pebble Beach home was designed for maximum light, privacy and garden views. Walls of glass frame views of the inviting courtyard and lush lawn. Inside, there are three fireplaces for maximum ambiance. The first is in the living room off the entry beside the formal dining table. The second is in the family room (with double leather recliners and a massive TV); the third is in the serene master suite (King bed and en suite bath with walk-in shower). The second guest room (King) is adjacent to the hallway bath, with a small tub/shower. The third guest room (Queen) is upstairs (with a private bath and shower), and the fourth—accessed via a separate entrance from the courtyard—features a King bed with a sitting area, a bath with a shower, and a kitchenette with a bistro table, range, refrigerator, and microwave. The main kitchen is a chef’s dream: white cabinetry with stainless appliances, gorgeous countertops and a central island. Sliding doors lead to the large exterior patio, with multiple lounging areas, a gas barbecue and standing heaters. 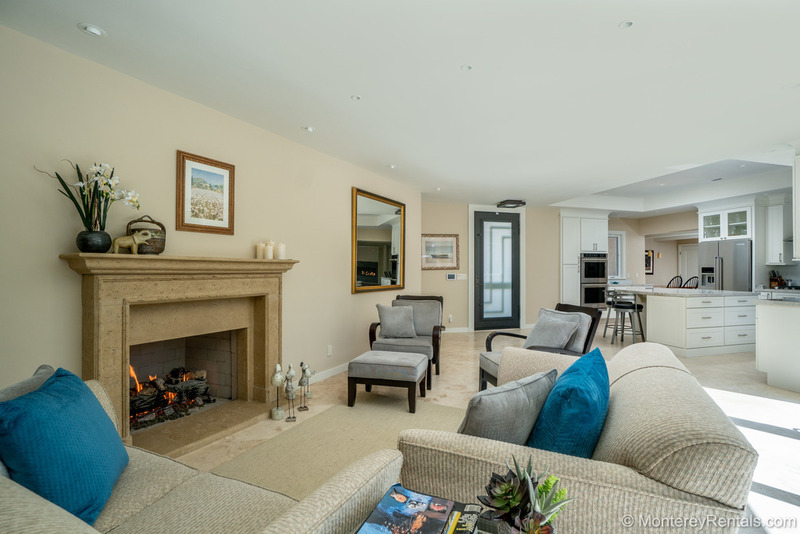 Located on a large corner lot, this 4-bedroom/4-bath contemporary is just blocks from the ocean—and minutes from MPCC, Spyglass, Spanish Bay, Poppy Hills and the world-renowned Pebble Beach links. The master suite has garden views, TV, fireplace, and private bath. Fourth guest room has a King bed and sitting area, a kitchenette, bath with shower, and a separate entrance from the courtyard.